Spring has finally arrived in Georgia! With temperatures in the mid 70s last week, it's great to finally be able to wear shorts and dresses. JoJo Maman BéBé is one of my go-to stores for the latest styles in kid's fashion and this year's spring collection did not disappoint. The quality, designs and variety of their garmets is simply unmatched. Their unique collections are always priced well and their pieces are versatile and easy to mix and match. Just like in years past, my kid's wore JoJo Maman BéBé for Easter. Jack has unfortunately outgrown the line but Dylan and Lucia's outfits came from this beloved store. Lucia wore an adorable duck print a-line dress. This dress is super soft and easy to wear all year round. Pair it with some cute sandals during hot months or add some tights and a cardigan or coat for the cooler months. How cute is this blue mini gingham shirt? Paired with some classic twill chino shorts -- available in 5 colors - this outfit is an perfect for any occasion. This shirt just like Lucia's dress, can be worn during cooler months. Simply pair it with some cords and a cardigan and you are set! One of my favorite things about JoJo - besides the amazing quality of their products and the prices - is their versatile designs. Most of their pieces are easy to mix and match or dress up or down depending on the occasion. During spring break, Lucia wore this adorable duck sequin tee with some simple blue cropped leggings. The best part? 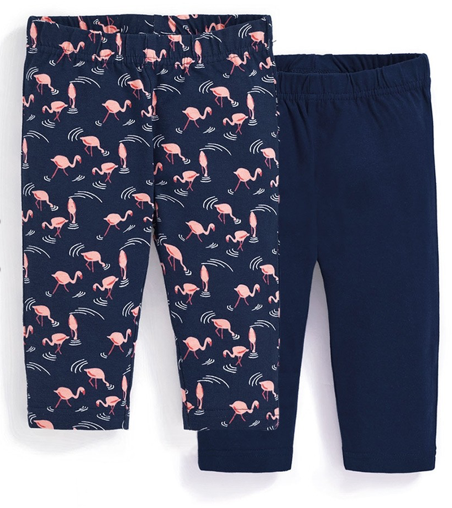 It comes in a 2 pack (for only $24) so she also got a pair of flamingo leggings! Inspired by French and British style, JoJo offers full range of children’s wear, maternity, nursing, toys, nursery decor and gifts. JoJo’s aesthetic and small brand values provides families around the world with everything they need for their children, from pregnancy through age 6.